Many different types of vehicles come equipped with roof racks. The feature enables vehicle owners to carry loads in addition to the cargo storage space. The racks can also haul items too large to fit inside. However, there are a number of tips to remember that allow you to get the most out of the amenity while preventing vehicle damage. Do not add more weight to the roof rack than the owner's manual recommends. 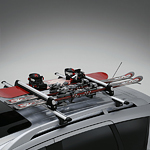 After loading the roof rack, tie the load down on the front and back of the rack and on the front and rear towing eyes supplied on the vehicle's interior. Otherwise, the resistance the load encounters as you drive down the road has the ability to remove the load and possibly the roof racks. For more information about roof racks and to see the features our vehicles offer, make a point of visiting Prestige Family of Dealerships.